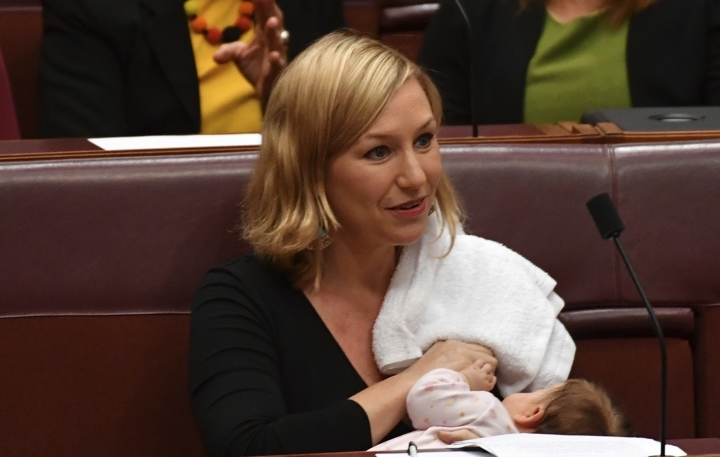 CANBERRA, Australia — An Australian senator has made history by breastfeeding her infant daughter on the floor of the country's Parliament. The Sydney Morning Herald reports Sen. Larissa Waters returned to Parliament on Tuesday for the first time since giving birth. She breastfed baby Alia during a vote on the floor of the chamber in the capital, Canberra. She later tweeted a photo of herself and Alia during the moment and added: "So proud that my daughter Alia is the first baby to be breastfed in the federal Parliament! We need more #women & parents in Parli." Waters earlier instigated changes to Senate rules giving new parents the option of briefly caring for infants on the floor of Parliament.